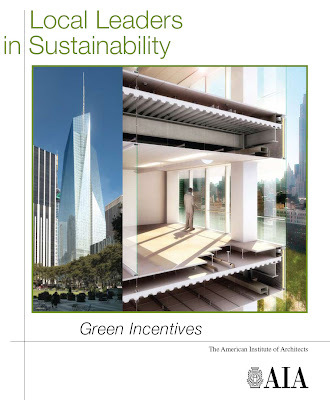 The AIA has just released a report on incentives for green buildings See a two page summary of incentives here. I figured this was a good enough time to discuss other incentive databases I've used in the past. Someone needs to pay for this stuff, so why not let it be someone other than you client? To be clear, many of the following resources are not LEED specific, but will feature programs that offer incentives for strategies used to achieve LEED credits or in some cases tax breaks and permitting bonuses for achieving the certification itself. A favorite of mine is the Database of State Incentives for Renewables & Efficiency (DSIRE) operated by North Carolina Solar Center out of NC State. It offers helpfully detailed info on any particular incentive listed, and is easily searched via a large map of the US. The database also includes information on related rules and regulations that may be found at the state and local level. There are also federal incentives listed. Most of the incentives relate to the installation of on-site renewable energy, but energy-efficiency loans, tak credits and grants are listed as well. There is also info on Renewable Energy Credits (RECs) - the pricing of which is going to be listed on an upcoming post! The National Association of Industrial and Office Properties released a report similar to the AIA's last year. It's bookended by some survey info that you can more or less skip. Go to pages 21-29 for the good stuff, which includes a list of muncipalities that specifically offer incentives for LEED certification. I know I missed somthing, mostly because this post only took about 30 minutes to author. Please share your incentive resources in the comments section!